You are old. Aging can wear out the heart, making you more susceptible to heart attack. You have high blood pressure or high cholesterol. This leads to ineffective pumping of blood by the heart, thereby leading to a heart attack. You suffer from obesity. Fat build up can cause heart to exert more force to pump blood which can lead to heart attack. Poor diet and stress. Both of it can wear out the heart by not providing the right nutrition to keep the heart healthy and not giving it time to relax. Although a heart attack can be a sudden onset, it is more commonly a build up. The signs appear hours and sometimes days in advance. 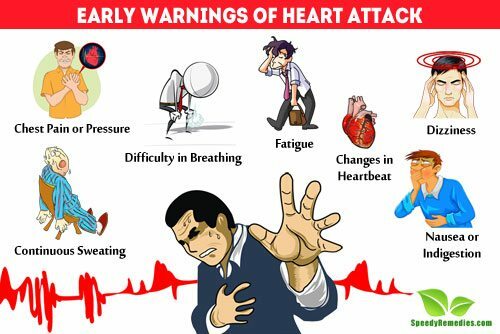 It is necessary to identify the signs of heart attack so that you are able to receive immediate medical attention. A kind of pain or pressure on the chest, or some discomfort has been the most cited experience by people who suffer heart attack. This is usually felt in the centre or left side of the chest. It might feel like someone is applying pressure on your chest or squeezing it from within. The sensation might be similar to that of a heartburn or indigestion. The pain can either be mild or severe. You might feel the pain at a continuous stretch or it might subside and come back in a repetitive manner. Your heart pumps blood, which travels through the body carrying with it the much needed oxygen. When the heart is unable to pump properly, as is in the case of a heart attack, the oxygen does not reach the body and you can therefore feel a shortness of breath. Shortness of breath can often be accompanied by getting unusually exhausted or tired, especially women. They might feel out of breath while doing relatively simple tasks like going out to pick up the newspaper might leave them gasping for breath. This is a common sign of heart attack. Sweating day and night or sweating more than usual, without any change in physical activities is a sign of heart attack. When the arteries are clogged, pumping blood through them takes more effort. During this extra exertion, the body sweats to keep the body temperature down. Therefore, you might experience cold sweats or clammy skin. Women might sometimes mistake this unusual sweating for a symptom of menopause. But if you are unable to sleep at night because of sweating or your sheets are soaked in sweat, then it is likely that your are experiencing a symptom of heart attack, and not menopause. Dizziness or light-headedness is a common symptom of heart attack. During a heart attack, the heart is not able to pump the blood efficiently. This means that adequate blood is not sent to the various parts of the body. When the brain does not receive enough blood due to arterial blockages, it can cause dizziness or light- headedness. You might feel like you are about to pass out when you stand up, which is not normal. If you feel this sensation, you need to contact medical emergency services immediately. Gastrointestinal problems can be a sign of an onset of heart attack. People often experience mild indigestion, nausea or an urge to vomit before they suffer from a heart attack. These symptoms are often ignored in older people since they regularly have gastrointestinal problems. But this could actually be a sign of a heart attack, especially in older people who are more likely to suffer from it. When your arteries are blocked, your heart has to work extra hard to pump the blood through your body. This stress on the heart can cause exhaustion and fatigue. If you constantly feel tired, even when not performing any physically exerting activities, you might be suffering from a symptom of heart attack. Fatigue is a rarely recognized symptom and is often dismissed as an onset of flu. It can also start months before the actual heart attack. So, if you feel exhausted for long periods of time, you should get it checked out, especially if it’s coupled with shortness of breath. You might notice changes in your heartbeat, ranging from feeling like your heart is skipping a beat to pounding or throbbing of your heart. You might feel the pounding even in your neck. When the blood flow is normal in the body, the heart beats normally. Heart palpitations could signal the onset of a heart attack. Don’t ignore the changes in the rhythm as constant irregular beating will require medical treatment. If your heart palpitations are accompanied with any of the other above mentioned symptoms, like light-headedness, chest pain or sweating, it is important that you get immediate medical attention. While chest is the most commonly affected area during a heart attack, it is not the only part of the body where pain can be felt. During a heart attack, you might feel pain in a number of areas. You might feel pain going down your left arm. It can also radiate from lower abdomen, shoulder, upper abdomen, jaw, teeth, neck, throat and back. It might be the case that there is no chest pain at all. Instead, you might feel pain or tightness in one of these areas. According to American Heart Association, women reported feeling pain particularly in the lower abdomen and lower part of the chest. They also alluded to experiencing upper back pain before a heart attack. If you experience any of these symptoms, especially in combination with other symptoms, it is important that you contact the medical emergency services immediately. You have a better chance of surviving the heart attack if you are in an ambulance. This is because the paramedics can provide you with the life saving treatment while you are on the way, thereby increasing your chances of making it through.